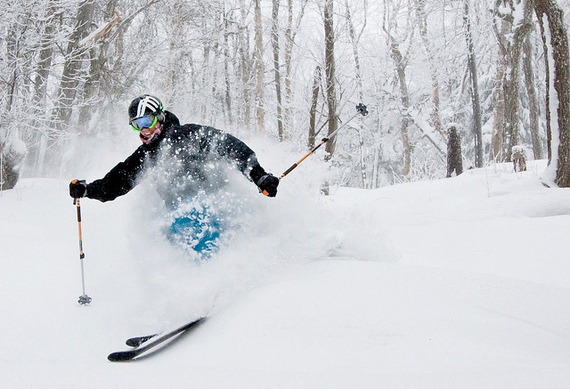 For more articles on skiing and ideas for traveling the Northeast, visit offMetro.com. March has long been associated with madness. There's the NCAA basketball tournament, Saint Patrick's Day, the Ides of March, Mardi Gras and Easter. But in the Northeast, March can offer some of the most serene skiing you'll experience all year--for those who know where to find it. On an overcast afternoon, I hauled my gear to Penn Station and boarded the Amtrak Vermonter (from $110/roundtrip) northbound for Brattleboro. It was nearly five hours into the six-hour train trip before I glimpsed the first patches of snow melting along the banks of the Connecticut River and I wondered if I might be too late. I had been reassured that Mount Snow would have a deep snowpack due to it owning one of the country's most advanced snowmaking operations. It was called Mount Snow, after all--though apparently named after the farmer, Reuben Snow, and not the fluffy white stuff blanketing its surface. I exited the train in Brattleboro, an old mill town built along the river. Just up the street from the train stop, I found the Brattleboro Food Co-op, which specializes in a variety of Vermont food products ranging from artisanal cheeses and smoked meats to all sorts of sweet maple treats. I grabbed a quick snack for the road and made a note to stop by and stock up before heading back to New York. I set off down a street lined with brick buildings--their big glass windows displaying locally produced handicrafts and food. On the edge of town, a white-and-black spotted bus bounced by in the other direction. This cow-fashioned vehicle was the DVTA Moover--a free shuttle service that takes you on the one-hour trip from Brattleboro to the mountain (Mount Snow also partners with Enterprise to offer special rates). The ride from the train station to the mountain winds through quaint towns populated by white, New England country homes with hunter-green shutters and big red barns. Covered bridges cross over mountain streams and sugar shacks spew sticky-sweet clouds from boiling sap. March is sugaring season in Vermont and everywhere you can see dented tin buckets nailed to Maple trees. Driving up the Mount Snow access road, the ClockTower and the red, triangle peaks of the resort stretching along the base of the mountain come into focus. At one point in the early 60's, the Boston Globe declared Mount Snow the biggest ski area in the world. It had everything: a heated outdoor pool and an indoor skating rink, a giant lodge, numerous trails and state-of-the art lifts. Arriving at the towering Grand Summit Lodge some fifty years later, it didn't take long to see that that owners still strive for world-class prestige. In the center of the lobby, surrounded by couches, a large fireplace shoots up like a stone beanstalk through a four-story atrium. It was easy to imagine the couches overflowing with people in colorful ski-sweaters sitting around the fire and swapping stories after a long day of skiing. I checked in at Grand Summit and dropped my bags off in the room, a spacious setup with two queen-sized beds and a small balcony with pleasant views of a trail under one of the mountain's 20 lifts. After a long train trip and ahead of a long day of skiing, I decided to unwind at Naturespa. Nearly all of the products here are made locally from plants and herbs found in the Green Mountain Forest. Along with treatments like hot rock massages and maple sugar polishes, the spa leads guided hikes and snowshoe treks where you can learn about foraging, organic gardening or even sketching and writing in nature. There are a number of packages that combine meditation, mountaineering, and massage treatment for a reasonable rate ($150- $300). Wobbly and totally at peace from a relaxation massage, I took a quick tour of the heated outdoor pool and fitness center before heading down to Harriman's Farm to Table Restaurant for a drink and dinner. I met a spirited local at the bar and we talked about the Winter Brewers Festival (April 1st), some of the concerts he's been to at the Snow Barn just down the road from the Lodge, and he introduced me to Vermont White--vodka made from milk sugar and smooth straight or in a martini ($10). I sampled the Mount Snow brown ale ($6), produced by local craft brewery Harpoon, and then it was off to the candle-lit ambience of the dining room. A member of the farm and chef partnership known as the Vermont Fresh Network, Harriman's serves up a hearty mix of sweet and savory local foods. The Vermont cheese plate with currant-habanero jam and Stony Point Farm honeycomb ($15) was a big hit and a great way to kick off the meal. At the table, meat-eaters and veggie-lovers split over the entrees--meat-eaters opting for the steak tenderloin special with roasted red peppers and bacon butter ($28) and the vegetarians going for the butternut bean burger ($14). Stuffed but unable to help myself, I finished the meal with a warm Lake Champlain Chocolate brownie with ginger ice cream ($7). I slept well and was up early to get ready for a long day of skiing. I went back to Harriman's for the breakfast buffet and got my fill of pancakes covered in pure Vermont maple syrup. After breakfast, I made the short walk up from the Grand Summit to the base of the mountain. It was a warm morning but a light rain was falling. The top of the mountain had disappeared beneath a grey mist. Ski and snowboard equipment rentals are $41 for the day but there are many deals for multiple day rentals if you purchase online. The Discovery Center, a multi-million dollar learning facility for adults and children, also offers their own package rates. 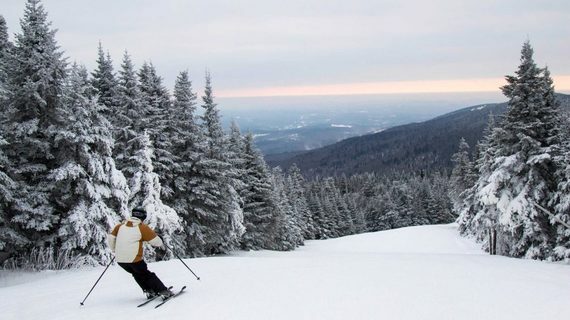 There are roughly a hundred trails at Mount Snow, the majority of them blue squares appropriate for intermediate level skiers, but skiers of all levels should be able to find something to match their ability. For the first run, I rode up in the Bluebird Express--the state's only bubble lift and described as the Cadillac of chairlifts. It seats six people and has a blue plastic dome that drops down to shield riders from cold winds, icy snow, and the occasional rain. Although the weather wasn't perfect, the snow was. It peeled away under the edges of my skis as I snaked around the mountain's well-groomed trails. I particularly enjoyed South Bowl to Drop--a gentle, winding trail along the tree line. For more adventurous routes, try the North Face or head over to Carinthia, the East's only all-park mountain face. Carinthia features a superpipe, natural rails built from trees, and plenty of jumps. It's been home to Olympic and X-game gold medalists and is popular with kids and adults alike. 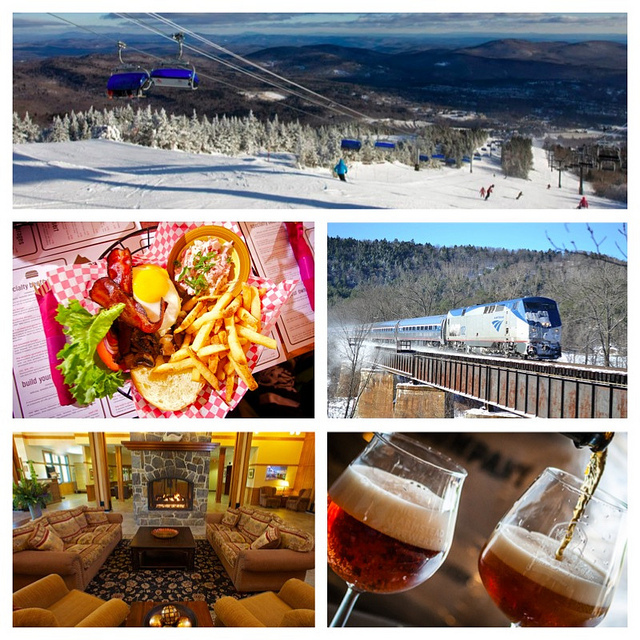 For après-ski, the Station Tap Room features eighteen rotating taps, many featuring Vermont craft beer. Keep an eye out for Hill Farmstead from Greensboro, VT; it was recently ranked the best brewery in the world by ratebeer.com. The life of the party, however, is at Cuzzins--the après bar known for live music and rowdy parties. Check out: mountsnow.com for more event dates along with a list of spring and summer activities including the opening day of golf and mountain biking season, and the Tough Mudder competition. Go to visitvermont.com for a comprehensive guide to the Mount Snow Valley. Mount Snow, 39 Mount Snow Road, West Dover, Vermont. Rooms from $250-$400/night depending on date and package.